"An easy way to prepare chicken that is economical too. Both my husband and my children love it!" 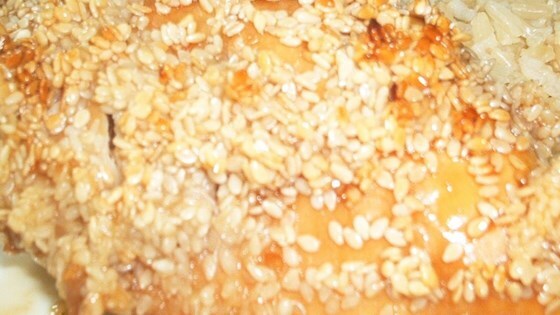 In a medium bowl, stir together the honey, soy sauce, lemon juice and sesame seeds. Dip the pieces of chicken into the sauce to coat, then place in a lightly greased 9x13 inch baking dish. Bake for about 45 minutes in the preheated oven, until chicken is cooked through and sauce is caramelized. Yummy and easy. I am a lazy cook, so I just poured the sauce over frozen chicken breasts and cooked for an hour. I liked the way the sauce tasted, but it didn't stick to the chicken at all. It made a huge mess in the pan, too.